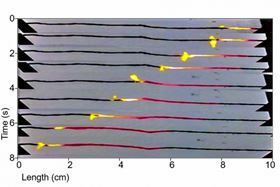 In this time-lapse series of photos, progressing from top to bottom, a coating of sucrose over a wire made of carbon nanotubes is lit at the right end, and burns from one end to the other. As it heats the wire, it drives a wave of electrons along with it, thus converting the heat into electricity. Photo courtesy of the researchers. The batteries that power the ubiquitous devices of modern life, from smartphones and computers to electric cars, are mostly made of materials such as lithium that are toxic, difficult to dispose of and have limited global supplies. Now, researchers at Massachusetts Institute of Technology (MIT) have come up with an alternative system for generating electricity, which harnesses heat and doesn’t use metals or toxic materials. The new system is based on a discovery announced in 2010 by Michael Strano, professor in chemical engineering at MIT, and his co-workers. They reported that a wire made from carbon nanotubes can produce an electrical current when it is progressively heated from one end to the other, by, for example coating it with a combustible material and then lighting one end to let it burn like a fuse. That discovery revealed a previously unknown phenomenon, but experiments at the time produced only a minuscule amount of current in a simple laboratory setup. Now, Strano and his team, including doctoral student Sayalee Mahajan, have increased the efficiency of the process more than a thousand-fold and have produced devices that can put out power that is, pound for pound, in the same ballpark as today's best batteries. The researchers caution, however, that it could take several years to develop this concept into a commercial product. These new results are published in a paper in Energy & Environmental Science. "It's actually remarkable that this [phenomenon] hasn't been studied before," Strano says. Much of his team's work on the project has focused on not just improving the efficiency of the process but also "developing the theory of how these things work". And the latest experiments, he says, show good agreement between theory and experimental results, providing strong confirmation of the underlying mechanism. Basically, the effect is caused by a pulse of heat pushing electrons through the bundle of carbon nanotubes: the pulse carries the electrons with it like a bunch of surfers riding a wave. One key finding that helped to verify the theory is that sometimes the wave of heat produces a single voltage, but sometimes it produces two different voltage regions at the same time. "Our mathematical model can describe why that occurs," Strano says, whereas alternative theories cannot account for this. The team's theory explains how the thermopower wave "divides into two different components", which sometimes reinforce one another and sometimes counter each other. According to Strano, the recent strides they’re made in improving the efficiency "brings [the technology] from a laboratory curiosity to being within striking distance of other portable energy technologies", such as lithium-ion batteries or fuel cells. The latest devices are more than 1% efficient at converting heat energy to electrical energy, which is "orders of magnitude more efficient than what's been reported before". In fact, the energy efficiency is about 10,000 times greater than that reported in the original paper in 2010. "It took lithium-ion technology 25 years to get where they are" in terms of efficiency, Strano points out, whereas this technology has had only a fifth of that development time. What is more, lithium is extremely flammable if the material ever gets exposed to the open air – unlike the fuel used in the new device, which is much safer and also renewable. While the initial experiments used potentially explosive materials to generate the pulse of heat that drives the reaction, the new work uses a much more benign fuel: sucrose, otherwise known as ordinary table sugar. But the team believes that other combustion materials have the potential to generate even higher efficiencies. Unlike technologies that are specific to a particular chemical formulation, the carbon nanotube-based power system works just with heat, so as better heat sources are developed they could simply be swapped into the system to improve its performance, Strano says. Already, the device is powerful enough to power simple electronic devices such as an LED light. And unlike batteries that can gradually lose power if they are stored for long periods, the new system should have a virtually indefinite shelf life. That could make it suitable for use in a deep-space probe that remains dormant for many years as it travels to a distant planet and then needs a quick burst of power to send back data when it reaches its destination. In addition, the new system is very scalable for use in the increasingly tiny wearable devices that are emerging. Batteries and fuel cells have limitations that make it difficult to shrink them to tiny sizes, says Mahajan, whereas this system "can scale down to very small limits. The scale of this is unique." Scientists have found that the most effective thermoelectric materials can be realized by shaping substances such as tin telluride into 1D nanowires.